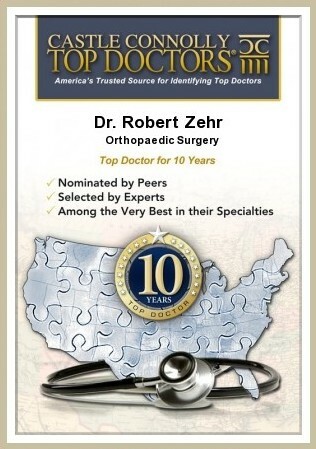 Naples orthopedic surgeon Robert J. Zehr, M.D. is a board-certified, fellowship-trained orthopaedic surgeon with over 30 years of experience who specializes in hip and knee replacement surgery. He is the founder of The Zehr Center for Orthopaedics; a private orthopaedic surgery practice located in Naples, Florida. The leading hip replacement surgeon in Naples, Dr. Zehr pioneered the direct anterior approach to hip replacement in Southwest Florida and has performed over 1,800 of the procedures. In addition, Dr. Zehr was the first surgeon in the area to bring same-day outpatient total hip replacement surgery to Southwest Florida. He performed this first groundbreaking surgery at the Seaside Surgery Center, which he founded. 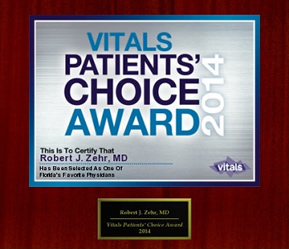 Consistently chosen as a Castle Connolly Top Doctor, Dr. Zehr has won numerous awards from peers and patients alike. Dr. Zehr has mastered minimally invasive surgical techniques. He has established pain management protocols and developed a rapid recovery rehab program. This means improved surgical outcomes, fewer complications, shortened hospital stays, and greater satisfaction for you. Are you experiencing difficulties affecting your hips or knees? Are you finding the pain from arthritis unmanageable? Are you looking for a solution? You’ve come to the right place! Naples’ newest wellness center is now open. The first of its kind in Southwest Florida, Longevity Performance Center brings together advanced technology, artificial intelligence, and scientific algorithms to create a new approach to health, wellness, and fitness. Dr. Robert J. Zehr highly recommends the LPC and its medically-based approach to fitness. Dr. Zehr replaced both of my hips during the past two years. The procedures were flawless and the outcome superb. My husband and I are both 78 years old and are pleased to say that our experiences with Dr. Zehr and his staff are above reproach. Everything about the operation is perfect or at least as perfect as you can get. What a pleasure with an absolute professional. I received excellent care and would recommend Dr. Zehr to anyone. If knee surgery could be considered pleasant, Dr. and staff made it as pleasant as possible. After 5 weeks, I was fishing on our 21-foot center console and even hooked a tarpon. Wish my right knee felt as good. That will be next. I have had wonderful results with my total knee replacement, and I would not hesitate to refer anyone to Dr. Zehr, including my family and loved ones. His knowledge and skill in his chosen field are complimented by his obvious compassion and caring.